Born at Warrnambool in 1892, Margaret Delahenty was a daughter of John Delahenty and Margaret Ahearn. John was a teacher and from around 1895 was head teacher at the Woodford State School. In 1904 he transferred to the East Geelong State School and the family moved to Garden Street, Geelong. Margaret was around twelve. John died in June 1908 at Geelong. From around 1913 Margaret was nursing at the Hamilton Hospital. In December 1915, she successfully passed her nursing exams. In June 1917, Margaret enlisted with the Australian Army Nursing Service and was soon preparing to leave for Salonika, Greece. 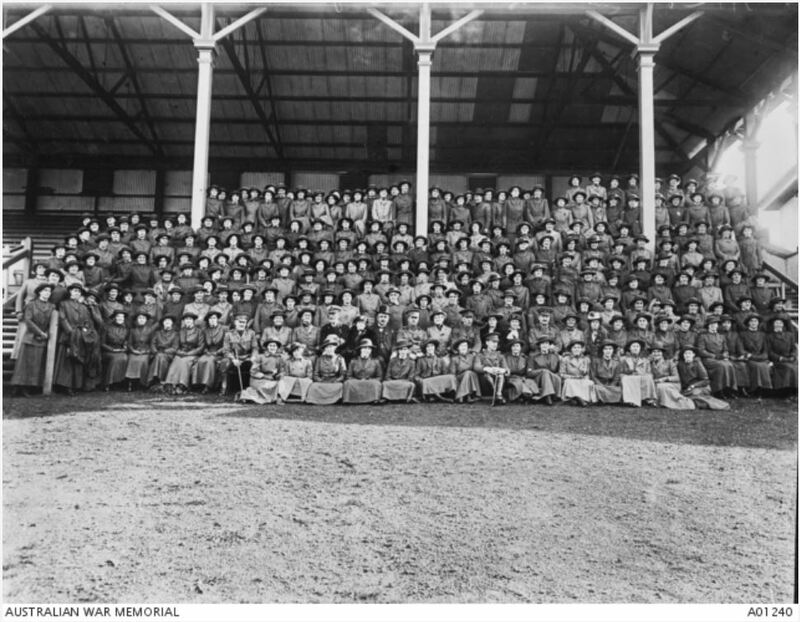 She is among the nurses photographed below in Adelaide before departure. Margaret left Australia on 12 June 1917 and arrived on 19 July 1917. She was with the No. 66 British Hospital at Hortaich then the No. 52 British General Hosptial at Kalamaria. Conditions were poor for the nurses at Salonika. The winters were freezing and during the hot summers, there was the constant threat of malaria requiring the nurses to cover up to protect themselves from mosquitos. Margaret returned to Australia on the transport ship Borda on 11 May 1919. In July 1919, Margaret received news she was mentioned in dispatches for her distinguished and gallant service between 1 October 1918 and 1 March 1919. On her return, Margaret nursed at the Ararat Hospital until around 1930. By 1931 she was living and working at the Children’s Welfare Department at Royal Park. From the mid-1930s she worked at the Caulfield Repatriation Hospital. In 1949, Margaret was living at 107 Royal Parade, Melbourne with William and Jean Delahenty and her occupation was still nursing. Margaret died in 1950 aged fifty-seven at Fitzroy.